On Diapers. And the Environment. What seems like a million billion years ago now, I was pregnant and mulling over having to cover another baby bum. I was also lamenting that we had used thousands (no exaggeration on that one) of Pampers for Bowie. We try to be as green as we can in our every day lives, but we had just let this one slip. I was on the hunt for a greener solution the second time around. After a little digging, I came across the newly founded The Honest Co. which really is a great company all-around, and the diapers are better for baby and earth than conventional ones, but still getting tossed in the trash, all 5000 of them. Was there something else? Or was I being too optimistic? Then, I mentioned The Honest Co. in a post, just in passing, and I was approached by the EarthBaby company recently to try their diapers, which are not only fully compostable, but a delivery person comes once a week, every week, to drop off diapers and wipes and take your old diapers away with them. I was a little skeptical at first about the whole process. I can’t remember why now, it’s all been going so smoothly. I think first and foremost I wondered if I could keep a bag of stinky diapers around my house for a whole week without it getting to me. Answer: a week goes a lot faster than you think. (Duh.) We’ve yet to encounter an odor problem. I also wondered about the quality of the diapers. They’re meant to be composted, after all, so how sturdy could they possibly be? And to be truthful, they are slightly more delicate than the average disposable diaper. A few times, I had the tabs come off when I was struggling to fasten them to a squirmy little baby. But, once they are on, they stay on, and we haven’t had one rip while actually on the baby. I also wondered how well they’d hold in the…stuff. If they’re made to be fully compostable, the absorbent materials must be sub-standard, right? Well, so far, not so. We haven’t had a single leak. In fact, we’ve even had issues with Ferris peeing through diapers overnight (the Honest diapers) so we got a box of conventional branded diapers made especially for overnight. The other night I forgot to put an overnight one on, and he wore an Earth Baby diaper all night, no issues, no leaks. Color me impressed. I also didn’t want the hassles of a delivery service. Having to deal with a stranger and coordinating drop off and pick up times and blah blah blah. But with EarthBaby, you leave your diapers on your stoop the morning of your delivery day, they come by and take them and leave the new diapers and wipes. No appointments, no doorbells, nothing. And if you forget to leave your dirty ones out, you’ll still get your new ones, you just leave the dirty ones the next week. I was also concerned about cost. I was getting this bundle deal from The Honest Co. and when I priced it all out, it seemed marginally more expensive than conventional diapers, but cheaper than most other delivery services. So I punched the numbers again for this post, and the difference was a couple of dollars per month. The two services are essentially the same price, and one service takes my dirty diapers and composts them. I think we know who comes out ahead here. Human waste composting is a very different process than curbside composting for kitchen scraps, lawn trimmings and cardboard. Please do not put soiled diapers in your city composting bin as it contaminates their composting stream. Reaching the high temperatures required to kill harmful bacteria and pathogens found in human waste is difficult and inconsistent when using common home composting techniques. To ensure that the soil produced when our products are composted is 100% safe, we only offer our diapers and wipes as part of our inclusive service whereby the products are composted in our regulated industrial composting facility. So, there it is folks. EarthBaby in a nutshell. Great product, convenient process, friendly customer service. Unfortunately, however, they currently only deliver to homes in the San Francisco Bay Area. But that’s where many of my readers are! So I just had to spread the good word anyway. The company has offered my readers one month of service, one pack of diapers and one pack of wipes FREE with this coupon code: VERYBLOGGY13 If you live in the Bay Area, please take advantage! 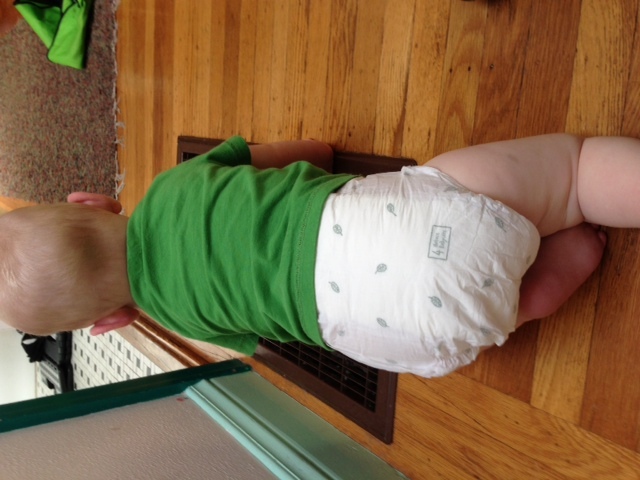 If you’re on the hunt for a great diapering solution, I highly recommend EarthBaby! Disclaimer: I was compensated by Earth Baby with product for this post, however all opinions are my own. 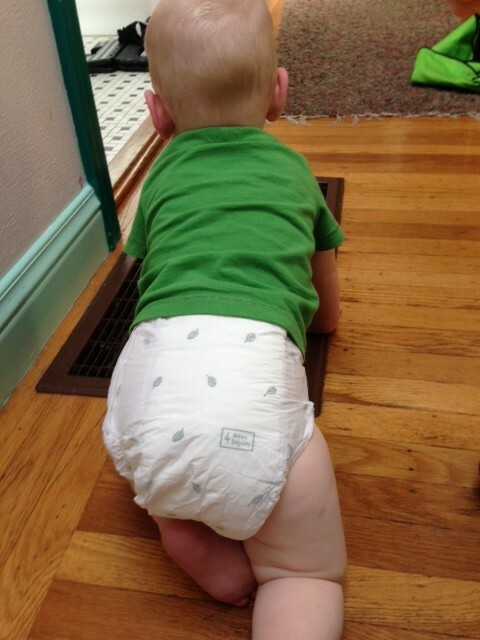 hello, what a cute little baby bottom crawling around!